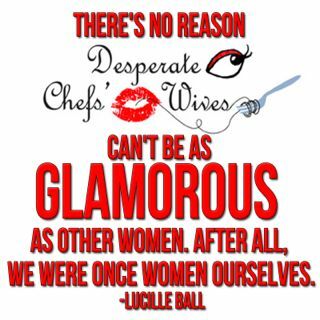 Many of you have been inquiring about ways to connect with other chefswives in your area. This is a fabulous idea. In fact, that is how this blog was started. My two good friends who were also dating chefs helped me so much that I knew others could use the support as well. Validation seems to be the key sentiment around here. The trouble is, I don't keep a log of readers. BUT I am going to do my best to help you get in touch with one another. If you have any ideas, please feel free to share them with me. There are two ways we can get connected. 2. You can also head on over to my friend Kerilyn Russo's website Married to a Chef and become a member of her village. This membership includes several goodies including membership to her private Facebook group. This group is a great way to post concerns, dilemmas, and accomplishments while getting feedback from other women connected to chefs. DON'T FORGET TO SIGN UP FOR THE BOOK GIVEAWAY, HERE. I'm new too this blog and the new girlfriend of a chef. I'm in Houston TX. When we started dating he was on medical leave and just recently went back to work. He warned me about the relationship he has with work. So far I'm doing alright. I know happy work makes him so I'm trying to be as supportive as I can and work around his schedule since I'm a 7-5. Hiya!!! I am a chefs girlfriend living in England, my goodness i cannot tell you how happy i am to have found this blog! I was beginning to go a tiny bit crazy. I have facebook too, and i would be so happy for anyone to say hello! Hi there! My husband is a chef and we live in NYC. Thanks for this blog! I am so happy to have found all of you! 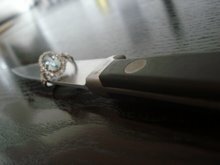 I am currently engaged to a future chef. We are getting married next September and he will be done with culinary school next May. 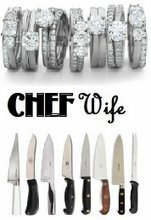 As the wedding becomes more real, so do the realities of life with a chef. As it is he is working full time and going to school full time. I see him 2 days a week if I am lucky. I am dreading how it will be when he is actually working in a restaurant. I can't wait to connect with all of you! Diane, South Bend, IN bsbdiane [at] email [dot] com.